Firstly, I have no idea how bloggers have the patience to photograph makeup and swatches. I am never happy with how colours translate to the screen. This is the best I could do and hopefully you get a general idea of the foundations I chose. For the past year my mineral foundation has been from Everyday Minerals. 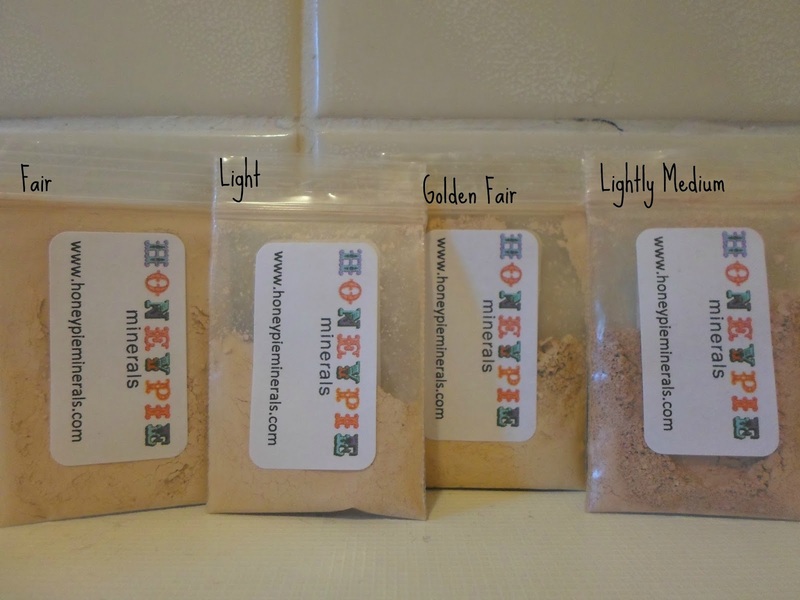 I am very happy with the product and was not looking to switch any time soon but once again curiosity got the better of me when I came across Honeypie Minerals. I ordered samples for 49p each and opted for Fair, Light, Lightly Medium and Golden Fair. Honeypie Minerals are cruelty free and free from synthetic ingredients including bismuth, talc, starch, rice, harsh chemicals, parabens, artificial colour, fragrance, paraffin, petroleum, oil, animal derived products, parabens, preservatives, alcohol, fillers, lanolin. I have enjoyed playing around with the samples and trying to colour match. Light is probably the closest match to my skin tone. I think these foundations wear very well on my skin. The finish feels natural and looks fresh but allows me to even out my complexion and hide small imperfections. If you like mineral makeup then have a look at the site. Honeypie Minerals also have blusher, eyeshadow, corrector, brushes and kits. UK delivery is free for orders over £20. You will have to let me know if you end up trying them. I know everyone else loves them but I don't get on with Lily Lolo foundation. I have never tried mineral makeup, but at 49p a go it would be rude not to. I've never really used mineral foundation but that is such a great price to give them a go! Great post! I have just ordered a couple of colours of the full size pots, looking forward to giving them a go. I'm with you sugarpuffish I can't get on with Lily Lolo either... it just sits in my wrinkles and does me no favours at all.